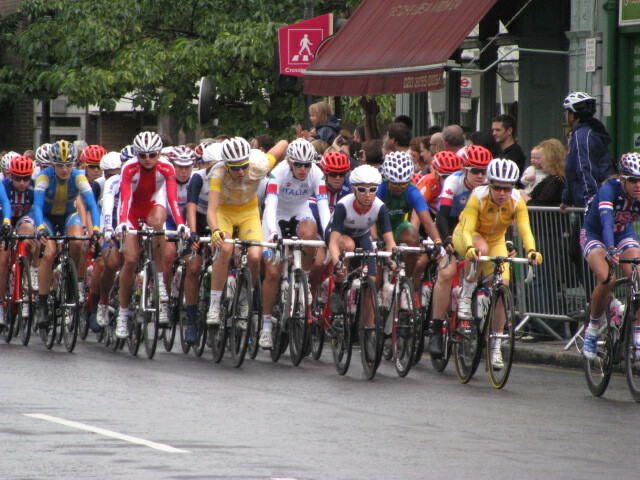 Today I had the privilege to watch the Women’s Cycling Road Race. When I arrived right before the start the weather wasn’t cooperating and it was sprinkling off and on. That didn’t deter the riders. I live close to the starting line and one rider was starting to break away from the group. Later in the day I claimed a good spot to watch the return of the riders. On my walk there the weather was pleasant. However, it started to sprinkle. Then I heard thunder. Soon it was really raining. When the riders flew by, it was pouring. Even though the weather wasn’t great, it was fun to see the race. 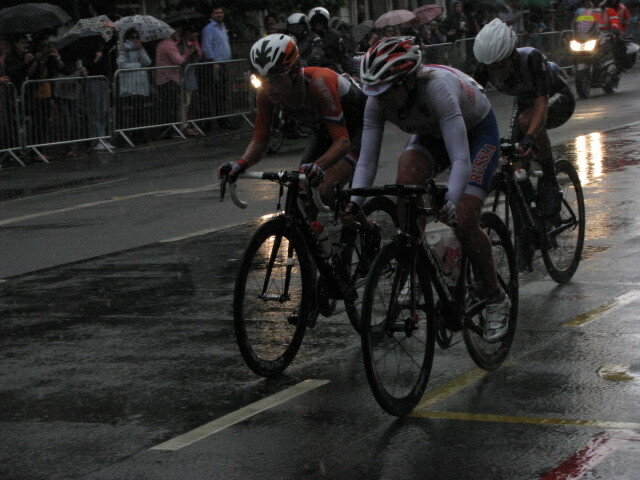 In addition, Lizzie Armitstead won the silver, which is Great Britain’s first medal of the 2012 Olympics. That’s pretty cool. I hope everyone is having an enjoyable time watching all of the events. This entry was posted in Sports and tagged 50 Year Project, Cycling, England, Great Britain, History, Life, Lizzie Armitstead, London, London 2012, Olympic Events, Olympics, Photography, Photos, Silver Medal, Sports, Team GB, Women's Cycling, Women's Cycling Road Race. Bookmark the permalink. Awesome pictures!!! I must admit I am a little jealous of you being THERE but hey—-you deserve it and what a time in history!!! Go USA and GB!!!! Hope you share more as the games continue for us who have to rely on the telly! I hope your son is enjoying! I’ll do my best to share. He just got home last night and had a blast—10 flights in 10 days!!! He said it was a very aggressive trip!!! Not for old folks like me, I think! I’ve had trips like that and it does take a lot of energy out of you. I’m glad he is home safe and sound and that he enjoyed! Congratulations to Great Britain and Lizzie. She must be on cloud 9 right now! Great story and photos. 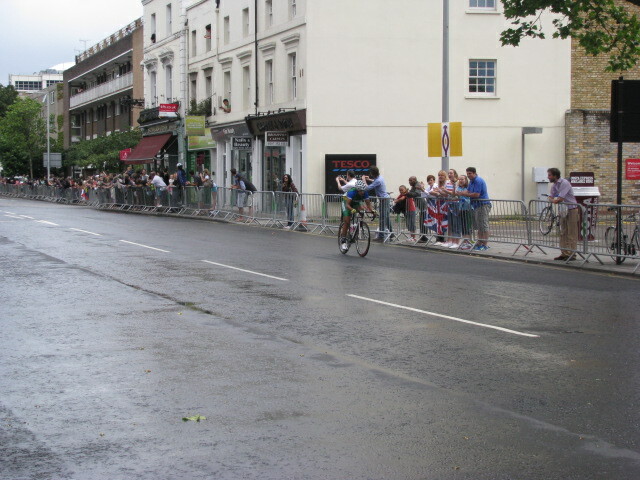 That would be so cool – to see an Olympic cycling event right outside where you live. It was fun to walk through my neighborhood to watch the event, but it is even more fun since every one is in a festive mood and to see all of the visitors is pretty cool. CONGRATULATIONS! We have been glued to our TV. Watched a couple spills and was hoping Britain would win a metal. Love your on site up front photos. Keep up the good work. Thanks Francine. We watched a fair bit of sports yesterday on the telly. I think for the next two weeks we will only watch the Olympics. It is such an amazing event and I love that people all over the world are glued to their TVs. oh wow what an amazing experience we should have arranged yesterday for you to hold up a big sign so I could have watched for you on tv 😀 will the time trials be passing your way? According to my neighborhood info, only the road race went by us. Ih’m not sure where the time trials will be. I think the next closest event to me is the Triathlon in Hyde Park, but that might be harder to witness. I’ll do my best. Then there is the marathon on Sunday. It was sad when I heard the news. I feel for her, all that training. I hope her foot recovers. A foot injury would be hard to compete with and I never like seeing an athlete push it too much and injure themselves further. Oh no…that is such a shame. Maybe she’ll surprise us. We just finished watching that race on TV. Can’t believe how they just keep going through the pouring rain… pretty awesome. They have a lot of heart to race in such conditions. Thank you…they are wonderful competitors and put on quite a show. I know that GB was disappointed the day before with not getting any medals. Hopefully now they can relax. 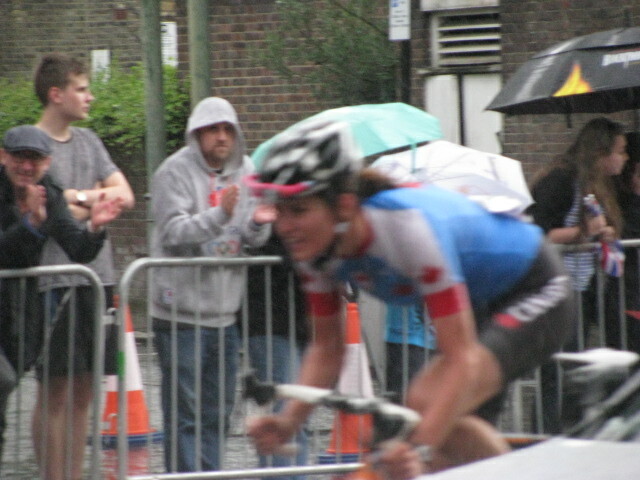 Bike racing in the rain—that’s on par with running in heels. Quite the altheletes, those women, and yeah for GB! Running in heels–that is an image! I’m glad Scrapydo. I’ll do my best to add more experiences for you. Can you imagine riding that fast in a tight pack? And then add rain! Yeah for Britian’s medal! I would have been terrified of wrecking in the rain. But I think that would be my fear anyway since they are so competitive and ride so close and fast. How cool that you can go watch some of the events! The athletes are amazing. When the weather threatened, I would have wanted to park my bike. I hate riding my bike in the rain and at that speed, no thanks! I was watching this race on tv. I couldn’t believe how hard it was raining. How great that you were able to watch in person. 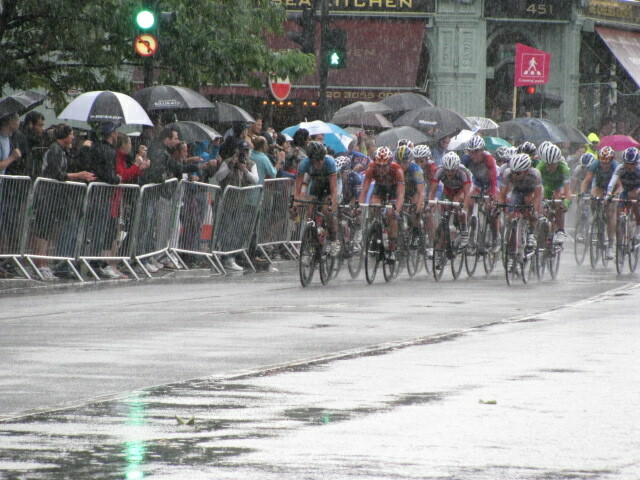 I saw all the spectators and wondered if they were bored – standing around for hours in the rain and then the riders pass in a flash. Good to know that it was as exciting to be there in person as to watch on tv. Fortunately I live close by so I walked down to watch the start and then later in the day I went back to watch the finish. I noticed that some of the people camped out all day. It would have to get a little boring, at least where I watched since there isn’t much to look at. What a great opportunity to see an event in person! We’re really lucky to live so close to the route. I think they scored at least one swimming medal last night as well. How exciting to have watched the race. It was fun, but the action was quick. You are right there!!! I’m so jealous! No, not really, but it must be so very thrilling. I watched him win it–on the telly. It was an amazing swim! Congratulation for the first silver medal. The cyclist lady did a great job! She really did and in difficult conditions. 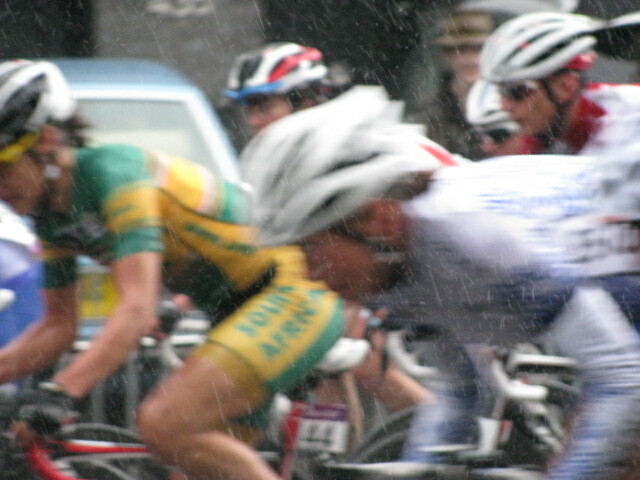 The rain made it a tad slick or the riders .. . Nonetheless, hoping for many more medals for the home team. They picked up one in gymnastics yesterday…that was pretty exciting! This event was free. Some of the events are open to the public, such as the marathon. The ticket prices vary quite a bit. I was looking for some this morning but couldn’t justify spending so much–but I was looking for football, which is in demand. But some events are pretty cheap. They are releasing more I think since the seats aren’t that full.